The truth about vaccines… what they don’t tell us! Anyone who has ever read any of our blogs or magazine articles, heard any of our radio shows or been to one of our live events and seminars have heard results from our years of research into the safety and efficacy of vaccine protocols. What many of you may not be aware of is the core research on file with the FDA that we have reviewed and previously during her time with the FDA, Dr Diane was actually in a unit that reviewed and evaluated vaccines. The truth of the matter is that most vaccines are not safe, untested, or ineffective. That’s right, I said it! Did you know that the test for effectiveness is based only on laboratory models, not scientifically based trials. Safety guidelines are only looked at for immediate reactions, not lifelong effects and in many cases they are not even formally approved. Typically, these unsafe foreign bodies are injected into un-natural ports of entry, (in reality, pathogens generally enter the body through oral or respiratory methods and are not injected into muscle), if they were, it would allow the body to have a natural immune response. For instance, if we ingest pathogens through food or drink, our body’s digestive enzymes and natural mechanisms will attack, destroy or pass them through naturally. In respiratory infiltration of disease, again a healthy immune system can take care of it and increase the response. When using vaccinations, the pathogen would not normally enter the body through the muscle or blood, hence the body has no natural path to follow. Now let’s look at what is in the vaccine to “make it work.” First and foremost are the deadly, toxic metals such as mercury and aluminum. In addition, ingredients such as MSG are added in so the body won’t reject it. Also added are synthetic sweeteners to speed the absorption rate which is also un-natural for a normal body response. What kind of natural response do you get? Now let’s ask the real question… what does your veterinarian know about vaccines and immune response? What were they taught in college? Here are some responses from veterinarians to this question. The following two quotations were published in an article titled “Vets On Vaccines” written by Catherine O’Driscoll in Dogs Naturally Magazine, March/April 2012 Issue… Dr Michael Dym: “Our training in veterinary school was not adequate with regards to immune system reactions in our animals. We were taught a one-size-fits-all vaccination program. There was nothing taught about the chronic immune reactions that can occur weeks, months or years later after vaccination in certain susceptible animals. From personal conversation with Ron Schultz, renowned veterinary immunologist, I learned that these important concepts are not taught in modern veterinary schools.” Dr Jeff Feinman: “My training in vet school was not complete with regard to the harmful effects that vaccines have on the immune system. The scientific evidence was not properly explored by the eighties. Vaccines were designed to help stimulate immunity. 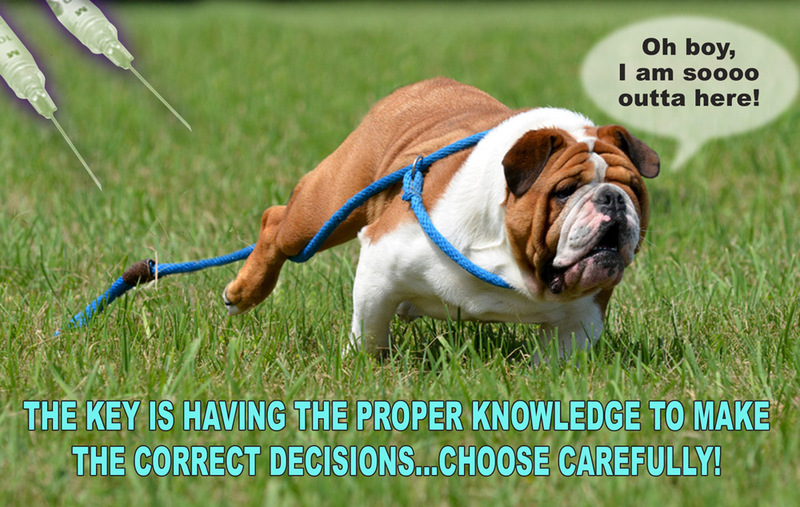 Current research is proving just the opposite however; even my graduate school immunology course (attended mainly by MD students) was incomplete.” In order to give you an overall view, you can look at this article which shows even more quotes from numerous veterinarians: at http://www.dogsnaturallymagazine.com/vets-on-vaccines/ . This is a magazine that all veterinarians have access to along with many other published veterinary trade magazines which you can access online. Vaccines have been linked to all kinds of life threatening health challenges and are now becoming a major problem in our pets leading to conditions such as cancer and endocrine disorders, along with autoimmune problems such as Cushing’s and Addison’s disease. Other conditions that are less severe such as allergies, scratching, itching, seizures, and behavioral problems are also directly linked to these deadly drugs. So, what is the benefit of vaccinating your pet and why is it such a big deal? First of all, rabies is the only required vaccine and it is my opinion that this has been required in order for local government to track that you pay your license fees. All other vaccinations are optional and most only cover diseases that juveniles are most susceptible to. In reality, it means that most conditions that your pets are being vaccinated for, they will most likely never get! So why do we risk our pets’ health and lives by using these dangerous vaccines? First we are not given a scientific and truthful explanation from our veterinarians. Please understand that they are not health experts but are medical providers. Don’t you want health and not medicine? Veterinarians do not study species, specific nutrition, genetics, behavior or physiology in order to guide you to having a healthy pet. Their training is essentially to treat symptoms and mitigate distress but not to necessarily cure. Listen closely to what they tell you… “your pet will get relief” “feel better” “not suffer” etc… they rarely make a claim to cure your pet’s problem. Which result do you want? Our goal is only to give you the facts and the information to ask the right questions. As you read this, we hope you will now understand what your pet is experiencing but cannot articulate. Pets give us their unconditional love every day. We must all remember to reward them with achieving the utmost knowledge in order to keep them happy, healthy and with us for many years to come…. ← When is Senior Truly “Senior” With our Pets?